DALLAS — On Friday afternoon at the 2015 Cooperative Baptist Fellowship General Assembly in Dallas, a group of Cooperative Baptists gathered to take part and witness the signing of covenants between new CBF church starters, CBF Global and CBF state and regional organizations. “This may sound kind of messy to you, but it’s exciting and God is in it,” said CBF Director of Missional Congregations Harry Rowland as he explained the delicate balance of support to church starters that is given through CBF Global resources and CBF state and regional organizations. (From left to right) CBF Director of Missional Congreations Harry Rowland, church starter Michael Mills, Coordinator for CBF West Glen Foster, church starter Josh James, church starter Doug McKinney, Coordinator for Mid-Atlantic CBF Trisha Miller-Manarin, CBF Church Starts Specialist Andy Hale. With the signing of a covenant between a church start and these entities, this is signing into a covenant of “how we’re going to relate together,” said Rowland, affirming that these documents are less about what is required of a church starter and more about love and support. Through entering into a covenant church starters are provided financial and spiritual support alongside two years of coaching through CBF. Entering into a covenant is not taken lightly, as this step comes after a discernment process that involves cohort participation and a deep and true commitment to partnership with the Fellowship, followed by commissioning as CBF church starters. 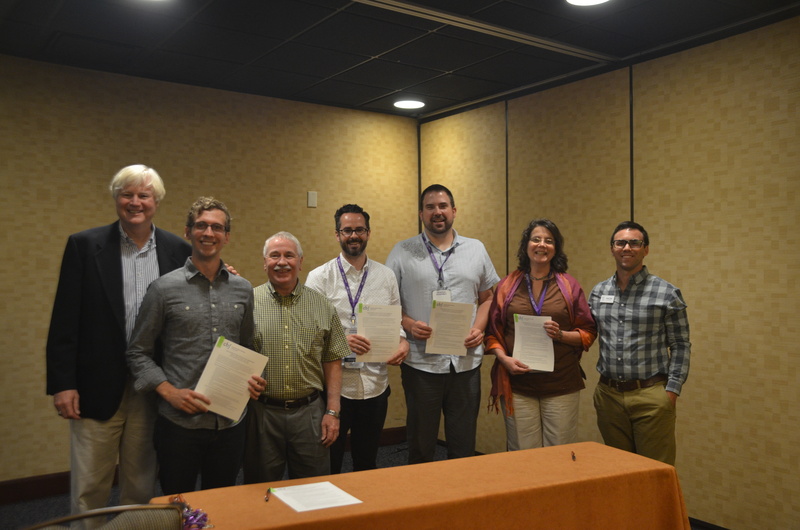 The CBF church starters that were commissioned at the 2015 General Assembly in Dallas entered into this covenant alongside representatives from CBF Global, CBF West and Mid-Atlantic CBF. Michael Mills of Inland Church in Spokane, Wash. entered into a covenant with CBF Global’s Rowland and CBF West Coordinator Glen Foster. Doug McKinney and Josh James entered into a covenant with Rowland and CBF Mid-Atlantic Coordinator Trisha Miller-Manarin. To keep up with news, photos and videos from the 2015 CBF General Assembly in Dallas, Texas, please visit www.cbf.net/Dallas2015.